One of the fastest developing European brands, Conotoxia, announced yet another international partnership. After revealing the partnership with the national football team of Wales, the brand uncovered the new long-term sponsorship deal with the Czech Football Association during a press conference in Prague. In the photo (from left to right): Piotr Kicinski, Conotoxia representative and Philipp Scherf, Head of International Relations, Czech Football Association. One of the largest Polish private companies gained the right to use the designation “the Official Sponsor of the Czech National Football Team”. Conotoxia has also become the official partner of the team in the areas of money transfers, payments, currency exchange and Forex. The multi-year agreement grants the company with the opportunities to expose its brands during the football matches on the LED boards and at the stadiums. The Conotoxia logo will gain extensive presence in the marketing communication of the Czech Football Association. The company also presented plans to carry out numerous promotional campaigns for the supporters of the Czech football team. Moreover, Conotoxia gained the right to use images of the national team’s players in its global marketing campaigns. “We are an innovative company providing a wide range of financial services across 30 European countries. This agreement with the Czech National Football Team is an important part of the marketing campaign we have planned for the Czech Republic,” said Marcin Pioro, owner of Conotoxia Holding Group. This is yet another international agreement signed by Conotoxia. Last week the company announced its partnership contract with the national team and Football Association of Wales. The company was also a global sponsor of last year’s UEFA EURO U21. Additionally, Conotoxia is the first European partner of the Chicago Bulls. In 2015, the NBA team signed a 7-year-long contract with the company. "We are carefully following the most dynamic brands on international markets. 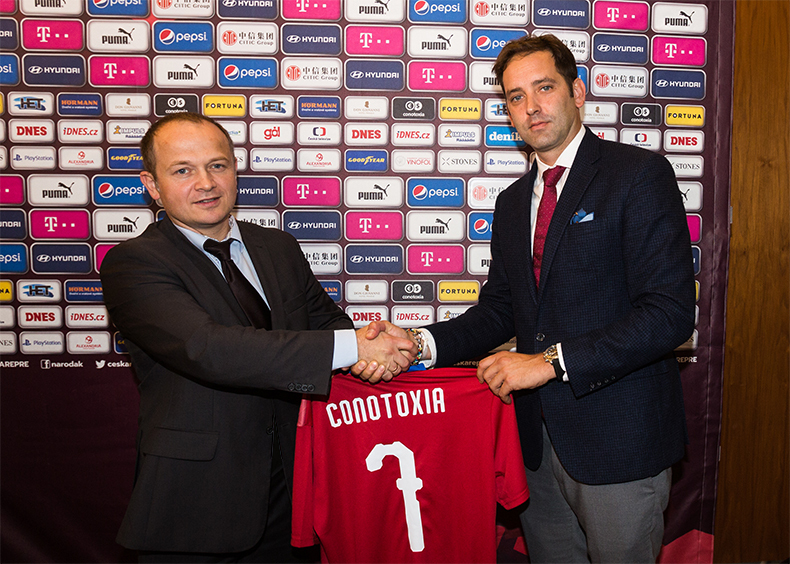 We are delighted that Conotoxia has become the official part of the Czech National Team for many years. We hope that our contract will help our team to successes not only in the upcoming battles of the Nations League, but also in the fight for participation in the EURO 2020, " said Mr. Martin Malík, the chairman of the Czech Football Association.